Predictably, when Al Jazeera broadcast The Lobby in January detailing Israeli subversion of British politics, the Zionist attack machine was fired up. They submitted five separate complaints to the media watchdog, Ofcom, alleging antisemitism, bias and invasion of privacy. 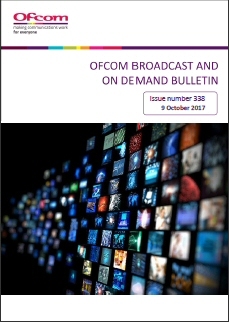 Ofcom undertook a detailed examination of the claims and published their 60 page findings on 9 October. On every aspect of each claim they found that Al Jazeera had conducted themselves with professional rigour and had breached neither broadcasting rules nor the IHRA (mis)definition of antisemitism. Each and every item of the lengthy allegations was rejected. For the first time, the IHRA definition has been tested by a British quasi-judicial tribunal: it determined not to classify criticism of Israeli activity as antisemitic. The guidance published with the IHRA’s working definition of anti-Semitism includes the following as a contemporary example (amongst others) of what could constitute anti- Semitism in public life and the media, taking into account the overall context: “Making mendacious, dehumanizing, demonizing, or stereotypical allegations about Jews as such or the power of Jews as collective — such as, especially but not exclusively, the myth about a world Jewish conspiracy or of Jews controlling the media, economy, government or other societal institutions”. The guidance also suggests that manifestations of anti-Semitism might include the targeting of the State of Israel, conceived as a Jewish collective. There was therefore the possibility that a programme, such as The Lobby, which focused on the actions of the State of Israel and alleged that individuals associated with it were attempting to inappropriately influence British democracy, may be considered by some to be anti-Semitic. Importantly however, the IHRA guidance makes clear that criticism of Israel similar to that levelled against any other country cannot be regarded as anti-Semitic. We considered that the allegations in the programme were not made on the grounds that any of the particular individuals concerned were Jewish and noted that no claims were made relating to their faith. We did not consider that the programme portrayed any negative stereotypes of Jewish people as controlling or seeking to control the media or governments. Rather, it was our view that these individuals featured in the programme in the context of its investigation into the alleged activities of a foreign state (the State of Israel acting through its UK Embassy) and their association with it. We also noted that a number of the organisations featured in the programme, such as Labour Friends of Israel and Conservative Friends of Israel, are not defined by any adherence to Judaism or having a predominantly Jewish membership. As per the IHRA guidance, Ofcom did not consider that such a critical analysis of the actions of a foreign state constituted anti-Semitism, particularly as the overall focus of the programme was to examine whether the State of Israel was acting in a manner that would be expected of other democratic nations. This attempt to extend antisemitism to cover criticism of the actions of the Israeli Government failed miserably, to the chagrin of the self-described Campaign Against Antisemitism. This failure echoes the failure of the Fraser case against the University and College Union to similarly extend the meaning of antisemitism. This second failure does not mean that we can relax about the threat posed by the IHRA definition. Israel’s apologists will continue to try to use it to suppress exposure of Israel’s actions until we can persuade this Government, or a future Labour Government, to accept that the eleven exemplars do not help in any way to identify antisemitic incidents. By sowing confusion, they obscure real antisemitic threats. ‘Ofcom has not upheld this complaint made by Ms Ella Rose of unjust or unfair treatment and unwarranted infringement of privacy’. The report goes into considerable detail about Ella Rose’s complaint but it can be summarised as saying she was very upset about being found out. She believes that her abuse of Jackie Walker and her smooth translation from Israeli Embassy employee to Director of the Jewish Labour Movement were of no public interest. The report states, ‘Ms Rose said that her personal religious faith which involves attachment to Israel should not make her “a target for infringement of privacy”’. This claim of impunity on the basis that Israel is part of her religion is radical restatement of the repeated assertion that any critique of Zionism is antisemitic. At no point does Ella Rose claim she was misrepresented, her distress is that she was represented all too accurately. She seems to believe that she has the right to stay in the shadows despite taking on the role of Director of an organisation seeking to influence Labour Party policy and therefore British political life. Russell Langer is former Campaigns Director at the Union of Jewish Students and the current Public Affairs Manager with the Jewish Leadership Council. As well as working with Israeli Embassy operative Shai Masot, Mr Langer seems to have had an irony bypass. Part of his complaint was that he was surreptitiously filmed preparing to surreptitiously film a meeting of Labour Friends of Palestine. 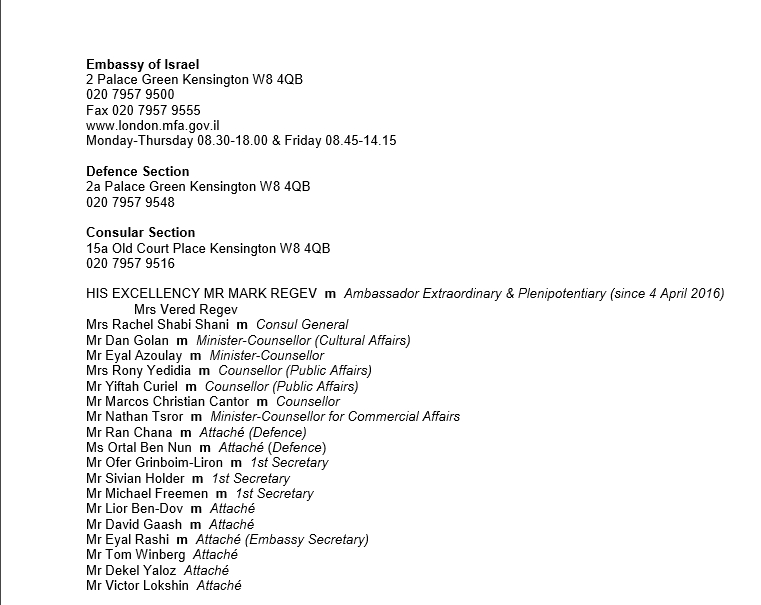 Mr Langer had complained about the excessive involvement of the Israeli Embassy in events organised by British Jewish organisations. Mr Langer also confirmed that he has relations with the Israeli Government. the footage of Mr Masot speaking with the undercover reporter had been “heavily edited” so it would have been unclear to viewers what the undercover reporter should liaise with Mr Akehurst about. From reviewing the unedited footage, it appeared to Ofcom that the conversation between Mr Masot and the undercover reporter had been edited in the programme as broadcast. However, it was our view that the extent of the editing was very limited and the conversation included in the programme was an accurate reflection of what was said about Mr Akehurst and the manner in which it was said in the unedited footage. Further, it was our view that the programme as broadcast would have made clear to viewers that Mr Masot wanted the undercover reporter to set up the youth wing of the LFI and that to do so, he should liaise with heads of other pro-Israel movements, such as Mr Akehurst. Therefore, we considered that the conversation had not been heavily or unfairly edited. It was Al Jazeera’s scrupulous accuracy that was so upsetting to Israel’s friends in this aspect as in many others. Claims of bias, unfairness and antisemitism made repeatedly against Israel’s critics are usually bounced around an echo chamber of like-minded groups. They gain a claimed authority with each repetition and endorsement. The lesson from this report is that when these claims are subjected to scrutiny they fall apart. We must insist that judgements of claims are made by panels that are not dominated by people who have already declared they see antisemitism everywhere and in every defence of Palestinian rights. Neither should they be judged by partisans for Palestine, as a finding of innocence would not be convincing to outside observers. They must be judged in impartial forums, when they are, in this case just as in Fraser v UCU, the claims of antisemitism are demonstrated to be protection of Israel not defence of Jews. Holocaust survivor Marika Sherwood was due to give a talk at the University of Manchester during Israel Apartheid Week 2017 with the title ‘A Holocaust survivor’s story and the Balfour declaration: You’re doing to the Palestinians what the Nazis did to me’. The University insisted the subtitle be removed and attendance limited to university students and staff only. The University was reluctant to disclose what led up to this interference with free expression until the Information Commissioner’s Office forced the University to reveal the relevant correspondence. As the Guardian reported on 29 September, the documents revealed that Israeli Embassy pressured the University to insist on the change, alleging that antisemitism lay behind the Holocaust survivor’s choice of title. I have written to Nancy Rothwell, the University Vice-Chancellor deploring the University’s action and calling for an apology to Ms Sherwood and the students who invited her for disparaging them as antisemites. Surat HaDin describes itself as working “with Western intelligence agencies, law enforcement branches and a network of volunteer lawyers across the globe to file legal actions on behalf of world Jewry” and is presumed to have close links with Mossad, the Israeli spy agency. It has a record of pursuing aggressive, and fortunately usually embarrassingly unsuccessful, lawsuits to silence critics of Israel. They have pursued charities, churches, journalists and academics who do not adhere to their apologias for Israeli crimes and of course presume an identity between their sponsors, the Israeli state, and “world Jewry”. They appear well-funded and setbacks do not halt their efforts to exploit US claims that their courts have worldwide jurisdiction in the USA’s ever expanding and morphing ‘war against terror’. Their most recent failure was when US District Judge Nicholas Garaufis threw out their billion dollar suit against Facebook. Shurat HaDin claimed that the social media corporation was assisting Hamas (in violation of the US Anti-Terrorism Act) in “recruiting, radicalizing, and instructing terrorists, raising funds, creating fear and carrying out attacks.” They claimed that, therefore, Facebook was liable for the exaggerated compensation that US law provides to ‘victims of terrorism’. The suit failed because the US law clearly states “No provider or user of an interactive computer service shall be treated as the publisher or speaker of any information provided by another information content provider.” The US has a long standing commitment to freedom of speech under the First Amendment but current and recent administrations express strong interest in curtailing this protection in pursuit of America’s self-identified ‘enemies’. Shrat HaDin took advantage of First Amendment rights themselves to post large billboards outside Mark Zukerberg’s home. Law in other jurisdictions, including the UK and Europe, is more cautious in claiming global scope but protection of free speech is also less robust. Current debate on the responsibility of Facebook, Twitter and other social media companies for content posted on their platforms gives rise ot concern. How the line is drawn between the unacceptable and the merely unwelcome to some sectional interests is going to be highly contested and crucial to maintaining space for promotion of Palestinian rights. We can expect Shurat HaDin and others to exploit any opportunity t drive critics of Israel off of social media with devastating impact on our ability to inform and organise. The UK Government’s adoption of the IHRA (mis)definition of antisemitism, and the drive to get the EU to adopt it, expands the definition of antisemitism to embrace legitimate debate on Israel’s actions. It is essential to prevent the IHRA definition being used as the benchmark for permitted speech in public meetings, on broadcast media or the internet. Analysis of the Letter Sent by All 100 US Senators to UN Secretary-General, about ‘eliminating Anti-Israel bias’. Last week, all 100 US senators signed a letter to UN Secretary General, demanding ‘equal treatment’ for Israel. The letter was an ostensible display of bipartisan unanimity about UN ‘anti-Israel bias’. While bias should definitely be examined, the blind cannot lead the blind. This letter is thus an exhibition of bipartisan bias – on behalf of Israel. Author FreeSpeechonIsraelPosted on 5 May 2017 5 May 2017 Categories Israeli interferenceTags BDS, Bernie Sanders, Marco Rubio, Richard Falk, UNHCR, US Senate, Virginaia TilleyLeave a comment on Bias, what Bias? Film maker Jon Pullman interviewed Naomi Wimborne-Idrissi and Mike Cushman to produce this video on the FSOI journey to playing a vital role in defending the space for action in support of Palestinian Rights. This is confirmed after seeing the astounding and undeniable revelations broadcast on 11 – 14 January in four half hour programmes on “Al Jazeera Investigates: The Lobby”. It is now my firm conclusion that the vilification of the Labour Party by the Home Affairs Committee and others is without foundation. The Shami Chakrabarti Report got it right about the level of antisemitism in the Labour Party; the Home Affairs Committee got it very wrong. It appears from the programmes that parts of the Labour Party are involved in this “outrageous interference”, including the upper echelons of the Jewish Labour Movement (JLM) represented by Jeremy Newmark and the Labour Friends of Israel (LFI) through its Parliamentary Officer, Michael Rubin. The four Al Jazeera programmes provide substantial and convincing evidence of Israeli Embassy initiatives through Shai Masot, its Senior Political Officer, and in other ways, to undermine the Leader of the Labour Party and his supporters in the Party who are seen to be sympathetic to the Palestinian people. This involves the active support and influencing of groups within the Labour Party including the Jewish Labour Movement, Labour Friends of Israel, Young Fabians, and We Believe in Israel / Britain Israel Communications & Research Centre (BICOM) – and the creation of other groups. The evidence presented in the Al Jazeera programmes makes clear that it is in this context that the vilification of the labour Party and its Leader should be seen – as should the vilification of others including Malia Bouattia, President of the National Union of Students, and of Jackie Walker, Labour Party member and former Vice Chair of Momentum’s National Committee. All of whom are also vilified in the Home Affairs Committee’s report on antisemitism. Michael Rubin is recorded in the same programme as saying: “We work with the Embassy quite a lot. When bad news stories come out about Israel, the Embassy sends us information so we can still counter it. We work really closely together. But a lot of it’s behind the scenes … but they (young Labour people) wouldn’t be happy if it (LFI) was seen as an Embassy thing… Being LFI allows us to reach out to people who wouldn’t want get involved with the Embassy … we obviously want the same end goal of getting more people to be more pro-Israel and understand the conflict. 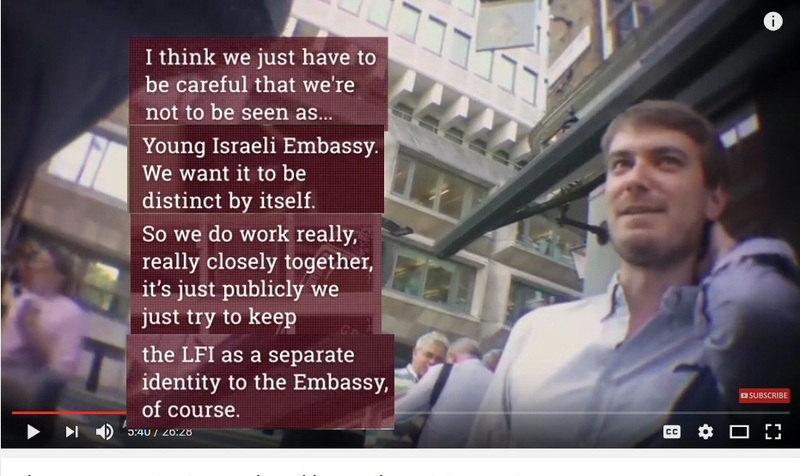 It’s just how you do it.” Other remarks from Shai Masot on purportedly independent groups he has been instrumental in setting up in Britain, including nudge, nudge, wink, wink type body language, indicate his clear view that LFI is not a body independent of the Israeli Embassy. At the private meeting with Labour Party activists at the Party’s Annual Conference referred to above, the Israeli Ambassador, Mark Regev, is recorded as saying: “The fashion is, if you are on the left today, you are probably very hostile to Israel, if not antisemitic.” Mr Regev also describes Hamas and Hezbollah in wholly derogatory terms as “These people are misogynistic, they are homophobic, they are racist, they are antisemitic, they are reactionary. I think that’s what we need to say”. Mr Regev made no reference to the origins of these bodies in the establishment of the state of Israel in Palestine by which they were forcibly dispossessed, as they see it, or to their current status within the Palestinian diaspora in the government of Lebanon and Palestine Authority. Yet both he and Joan Ryan had no compunction in making an official complaint to the Labour Party about a fellow Labour Party member on this non-existent basis. Not only that, but Joan Ryan went on that same evening to announce at a rally to combat antisemitism organized by the JLM, “We have also had three incidents of antisemitic harassment on our stand to the people who are staffing that stall today” – of which she makes clear subsequently that the one involving Jean Fitzpatrick was in her view the worst. Is this the stuff on which the internal assault on Jeremy Corbyn using allegations of endemic antisemitism as hammer blows with which to strike him, is based? Judging by this and other recorded episodes such as that of Ruth Smeeth MP described in my Critique, I share the view of Ilan Pappe, Israeli historian, expressed on the Al Jazeera programmes that as evidence they are “pathetic”. They are also illustrative of a disturbing mind-set, apparently all too willing to perceive inconvenient or uncomfortable behaviour as antisemitic, including justified criticism of Israel’s indefensible and unlawful conduct in the occupied West Bank. Despite being informed of the results of Al Jazeera Investigates, Joan Ryan asserted that her actions were “entirely appropriate”. This beggars belief. The programmes also revealed the insensitive subsequent handling by the Labour Party of the complaint made by Joan Ryan, which caused Jean Fitzpatrick great and wholly unjustified anxiety. The Party’s letter to Jean Fitzpatrick does not make clear who the complainant was, referring inaccurately to her allegedly having spoken “… to a member of party staff”, not to the complainant. The complaint was eventually not upheld. At the same LFI stand at the Labour Party Annual Conference, we also heard Chuka Umunna MP, after he had hugged Jennifer Gerber, Director of the LFI, and heard Alex Richardson’s unspecific account of the alleged antisemitic incidents involving Party members, say: It’s disgraceful. We’ll prevail. We’ll prevail in the end”. This was shortly after the re-election of Jeremy Corbyn as Labour Party Leader and shortly before publication of the Home Affairs Committee’s Report. This apparent reference to events inside the Labour Party provides further support for my Critique’s conclusion that the Home Affairs Committee’s inquiry into antisemitism had been hi-jacked by the internal Labour Party dissension following the PLP’s vote of no confidence in Jeremy Corbyn, a dissension which was pursued in the Committee’s Report. The unacceptable treatment of Jackie Walker is also fully revealed in the Al Jazeera programmes. The alleged antisemitism took place at the same Labour Party Annual Conference at a purported training session led by Mike Katz, one of the Vice Chairs of JLM. Someone was secretly recording the trainer’s contribution and the subsequent debate. There is no antisemitism in what Jackie Walker said. Some might take exception to her comment on International Holocaust Day but it is not antisemitic. There was clear misunderstanding of her intent in making that remark, which Jackie Walker attempted to correct, but there was no exploration of her explanation, which is most surprising in a training session. It is clear that Jackie Walker, like Malia Bouattia, is an anti-Zionist, not an antisemite. I agree with Jackie Walker’s reaction of – let’s have a debate about that – Zionism and anti-Zionism – not about this – the false and destructive equation of anti-Zionism with antisemitism. In practice, the abuse seems to be the other way round; first in the leaking of information to a news outlet, the Jewish Chronicle, from a training session by, it is claimed, a member of the JLM; second in the subsequent statement by the Board of Deputies of British Jews who called Jackie Walker “an unapologetic Jew baiter” – a most outrageous and unfounded remark from a supposedly respectable body towards a Jewish, black woman who is an anti-racism trainer and advocate in relation to the African Holocaust at the hands of the slavers; and third in the recorded conduct of Ella Rose, the then new Director of the JLM and formerly an official at the Israeli Embassy in London. Ella Rose, in addition to expression of a number of expletives, is recorded as saying: “I saw Jackie Walker on Saturday and thought, you know what, I could take her, she’s like 5’ 2” and tiny. That’s why I can take Jackie Walker; Krav Maga training.” [A hand to hand combat technique developed by the Israeli military.] I agree with Jackie Walker’s response when shown this recording that it was “breath-taking” and that it “says it all”. Unless it has evidence of which I and others are unaware, the Labour Party should drop the allegation against Jackie Walker forthwith. It is not acceptable that the matter has not been concluded to date, which is also the case I understand with the complaint against Ken Livingstone. These events illustrate the chilling effect on free speech the unjustified vilification of the Labour Party could well have – and appears to be having now. This is to the detriment of our open democracy and to our hard won right to speak up without fear or favour – in this instance for the cruelly oppressed people of Palestine. This is wholly unacceptable as the de facto annexation of the West Bank takes place in plain view through the Israeli state sponsored settler movement and the frequent bulldozing of Palestinian homes, olive groves and business premises – most recently resulting in the deaths of two Palestinians in the dawn raid by Israeli troops on 18 January to demolish the Palestinian Bedouin village of Umm Al-Hiran. In plain view, that is, to those who have open minds and eyes willing to see it – but not to those whose minds are closed and do not wish to see it for what it is. Here we have, as they see it, a dispossessed people being oppressed and further dispossessed by the strongest military power in the Middle East for whom the accustomed status of victimhood fits increasing ill. And which seems determined upon expansion of its territory way beyond Israel’s internationally recognized 1967 boundaries, not just in respect of the bitterly disputed areas of East Jerusalem. Yet our government seems unwilling to say boo to this goose and, in common with other governments, huffs and puffs to no effect, preferring occasional votes at the UN. Yet Mr Netanyahu asserts that legitimate protest through the Boycott, Divestment and Sanctions campaign by the Palestinian people and others is “a moral outrage” – with no gainsay from those with the power to make it count. If anyone has the right to feel “moral outrage” it is the people of Palestine; and the people of our own country at a foreign government’s now exposed efforts to interfere in our democratic affairs. It is in this bitterly divided context that the Al Jazeera programmes also vividly illustrate the great danger of the government’s proposed definition of antisemitism. They help to make clear the considerable scope for incorrect interpretation of a fair exercise of free speech in the intended examples in that definition, including: “denying the Jewish people their right to self-determination …”, which many people unjustifiably equate with informed and persistent questioning of Israel’s behaviour towards the Palestinians, or with anti-Zionism which is inaccurately equated with antisemitism; and “Manifestations might include the targeting of the state of Israel, conceived as a Jewish collectivity”, which as I point out in my comments on the proposed definition, is precisely how many British and Israeli Jews do see Israel – including, according to his own recorded words, Israel’s Minister of Public Security, Strategic Affairs and Public Diplomacy (see above). From the Al Jazeera programmes and from other events such as Ruth Smeeth MP’s conduct at and after the launch of the Shami Chakrabarti Report, my clear impression is that there is an over-propensity on the part of some people involved in these matters to interpret conduct as antisemitic when to the objective ear it is not. It is imperative that the government does not encourage this by adopting its proposed definition. Its adoption would be harmful not helpful to the cause of combating antisemitism – and would risk that honourable cause being brought into disrepute. It is also most important, as Peter Oborne says in the Al Jazeera programmes about Shai Masot and the Israeli Embassy’s “outrageous interference” in the United Kingdom’s democratic process, that it should not be tolerated in the quiescent manner the government affects. It requires full, fearless and open investigation. It is imperative that the Labour Party respects the informed and objective conclusion of the Shami Chakrabarti Report that “The Labour Party is not overrun by antisemitism…” And that the Party disregards the conclusions of the Home Affairs Committee’s Report in this regard – as not being worth the paper they are written on. It is time to stand up and speak out against these various outrages and not to be cowed by fear of being falsely accused of antisemitism. An accusation which does as much harm to Israel and its legitimate right to live without fear within its internationally recognized boundaries as to the equally legitimate right of the Palestinian people to be secure in their own homeland. This is what Jean Fitzgerald was asking Joan Ryan MP about: it is to our collective shame that answer was there none, other than hurtful accusation. We must also speak out against the neglect of the true facts by the BBC and the large majority of the privately owned British media. We need to stand up and be counted as true democrats in the honourable tradition of Tom Paine who, I guess, would have a thing or two to say about the current state of affairs. Perhaps “He who dares not offend cannot be honest” might be apposite. The Israeli Embassy has seventeen Israeli “technical and administrative staff” granted visas by the Foreign and Commonwealth Office. The normal number for an Embassy that size would be about two. I spoke to two similar size non-EU Embassies this morning, one has two and one zero. I recall I dealt with an angry Foreign Minister during my own FCO career incensed his much larger High Commission had been refused by the FCO an increase from three to four technical and administrative staff. 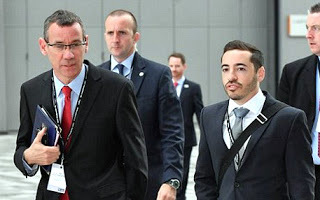 Shai Masot, the Israeli “diplomat” who had been subverting Britain’s internal democracy with large sums of cash and plans to concoct scandal against a pro-Palestinian British minister, did not appear in the official diplomatic list. I queried this with the FCO, and was asked to put my request in writing. A full three weeks later and after dozens of phone calls, they reluctantly revealed that Masot was on the “technical and administrative staff” of the Israeli Embassy. This is plainly a nonsense. Masot, as an ex-Major in the Israeli Navy and senior officer in the Ministry of Strategic Affairs, is plainly senior to many who are on the Diplomatic List, which includes typists and personal assistants. There are six attaches – support staff – already on the List. Masot was plainly not carrying out technical and administrative duties. The term is a formal one from the Vienna Convention on Diplomatic Relations, and it is plain from the convention that technical and administrative staff are in official status lower than the diplomatic staff. The majority of support activities are carried out in all Embassies by locally engaged staff already resident in the host country, but a very small number of technical and administrative staff may be allowed visas for work in particularly secure areas. They may be an IT and communications technician, possibly a cleaner in the most sensitive physical areas, and perhaps property management. These staff do not interact with politicians of the host state or attend high level meetings beside the Ambassador. The level at which Shai Masot was operating was appropriate to a Counsellor or First Secretary in an Embassy. Masot’s formal rank as an officer in his cover job in the Ministry of Strategic Affairs would entitle him to that rank in the Embassy if this were a normal appointment. The Al Jazeera documentaries plainly revealed that Masot was working as an intelligence officer, acquiring and financing “agents of influence”. It is simply impossible that the FCO would normally grant seventeen technical and administrative visas to support sixteen diplomats, when six of the sixteen are already support staff. The only possible explanation, confirmed absolutely by Masot’s behaviour, is that the FCO has knowingly connived at settling a large nest of Israeli spies in London. I fairly put this to the FCO and they refused to comment. I asked my questions on 10 January. On 12 January the FCO asked me to put them in writing. On 2 February they finally replied to the first three questions, but refused to comment on questions 4 or 5 about involvement of the intelligence services in Masot’s appointment. FCO Media Department have replied that they refuse to give me any further information on the subject, and that I should proceed through a Freedom of Information request so the FCO can assess properly whether the release of any further information is in the national interest. What is it they are always saying to us: if you have got nothing to fear, you have got nothing to hide? I am confident I know what they are hiding, and that is FCO complicity in a large nest of Israeli spies seeking to influence policy and opinion in the UK in a pro-Israeli direction. That is why the government reaction to one of those spies being caught on camera plotting a scandal against an FCO minister, and giving £1 million to anti-Corbyn MPs, was so astonishingly muted. It is also worth noting that while the media could not completely ignore the fantastic al Jazeera documentaries that exposed the scandal, it was a matter of a brief article and no follow up digging. This was not just a curiosity, it reveals a deep-seated problem for our democracy. I intend to continue picking at it. 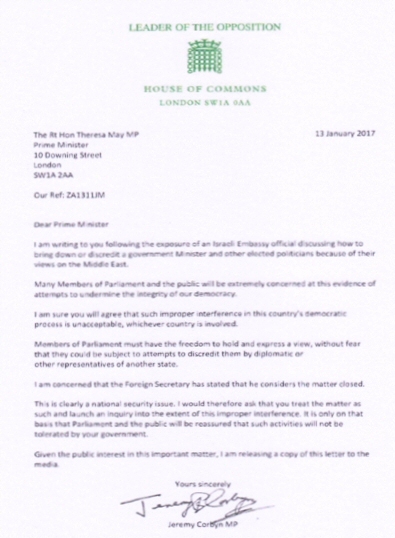 London, 18 January – Film evidence that Labour and Conservative pro-Israel lobbyists worked with the Israeli Embassy to undermine political opponents has implications for democratic processes in the UK that must be fully investigated, campaigners say. “There must be no cover-up of what appears to have been a concerted campaign to discredit supporters of Palestine, Conservative as well as Labour, and to use concocted allegations of antisemitism to undermine Jeremy Corbyn and his support base,” said Naomi Wimborne-Idrissi, speaking for Free Speech on Israel (FSOI). Theresa May has rejected a call from Corbyn for a government inquiry into the Embassy’s “improper interference in this country’s democratic process.” But a number of Jewish groups that work for Palestinian human rights are supporting the Labour leader’s call and urging Labour to set up its own inquiry into the activities of politicians and lobbyists implicated by Al-Jazeera’s four-part documentary The Lobby. The documentary showed an Israeli Embassy staffer discussing with a Conservative ministerial aide how to “take down” deputy foreign secretary Alan Duncan. It also revealed extensive collaboration between the embassy, Labour Friends of Israel (LFI) and Labour Party affiliate the Jewish Labour Movement (JLM). Both organisations have consistently alleged antisemitism against supporters of Palestinian rights who criticise Israel. Many of these have been suspended and subjected to disciplinary procedures that lack transparency and take no account of natural justice. FSOI calls upon Labour’s National Executive Committee to institute a full review of all outstanding disciplinary proceedings and to investigate the activities of both JLM and LFI. We note with concern the very serious allegations of Israeli Embassy interference in the United Kingdom’s democratic processes revealed in the Al Jazeera series “The Lobby”. We support Jeremy Corbyn’s call on the Government to hold an enquiry into this attempt to subvert both the government itself and the Opposition. It is imperative that the Foreign Affairs Select Committee should summon those Israelis and British politicians and lobbyists shown to have been implicated. We also call on the Labour party to conduct an immediate investigation into the involvement of its own members in the activities documented by Al-Jazeera. 4. Free Speech on Israel (FSOI) was founded as a predominantly Jewish campaign group in Spring 2016 to counter the manufactured moral panic over a supposed epidemic of antisemitism in the UK. Its earlier statement on the Al-Jazeera investigation can be read here. 5. Avi Shlaim, emeritus professor of international relations at Oxford University, analyses the relevance of the Al-Jazeera revelations, examining how anti-Zionism is deliberately conflated with antisemitism to suppress legitimate criticisms of Israeli policies. a) Black Jewish activist Jackie Walker, former vice-chair of Momentum, is currently fighting her second bout of suspension from the party. She intends to make a formal complaint against Jewish Labour Movement director Ella Rose, seen threatening and abusing Walker in the second episode of the film. b) The films show Labour Friends of Israel chair Joan Ryan MP discussing at length with fellow lobbyists how to frame a complaint of antisemitism against a Labour Party member, a woman who was suspended as a result and later reinstated on appeal. c) Separately, activists in a party branch in the Liverpool constituency of former LFI chair, Louise Ellman MP, are fighting baseless allegations of antisemitism which have been used as an excuse to investigate the entire branch. Unverified reports of Russian interference with the US election have been whipping through the British media like a hurricane. Fully authenticated reports of Israeli subversion of British Democracy can be heard like the faintest breeze in a distant forest. Labour Party calls for a Government investigation have been ignored. Scandalously the Labour Party is not calling for an internal investigation into the deep penetration of its own structures. Al Jazeera, over four days in January, broadcast The Lobby a detailed investigation into the activities of London based Israeli diplomats. The programmes show them planning the downfall of opponents of Israeli occupation and Apartheid in both the Labour and Tory Parties and elsewhere and the creation of false antisemitic slurs. The programmes shine a light into the murky sewers of the concerted attempts by Israel’s acolytes and Labour right-wingers to destabilise Jeremy Corbyn’s leadership of the Labour Party to advance their separate but overlapping agendas. The programmes focus on the activities of Shai Masot, a senior political officer at the Israeli embassy in London, and his attempts to: set up pro-Israel lobby groups inside the Labour Party; fund Israel supporting activities; and undermine the elected leaders of the Labour Party and the National Union of Students; and more. The programmes mainly consist of secret recordings made by an Al Jazeera journalist. ‘Robin’, posing as an aspiring Zionist activist supplemented by commentaries by expert observers of Israeli activities. The two key organisations of Israel apologists inside the Labour Party are the ‘Jewish Labour Movement’ (JLM), an affiliated organisation of the Labour Party operating in constituency parties, and Labour Friends of Israel (LFI), a parliamentary group. The JLM, which is affiliated to the World Zionist Organisation and is a sister party of the Israel Labor Party (ILP), has, in the last couple of years, been roused from a decades long torpor to play a leading role in defaming critics of Israel. The ILP is a fiercely Zionist organisation: it initiated the settlement programme after the 1967 war and to dispel doubts has rebranded itself as the Zionist Union. Although formally in opposition to Netanyahu’s far right government, it has actively pursued a strategy of trying to join the Government coalition. A telling incident in the programmes is from the 2016 Labour Party Conference when a sympathiser with Palestine approached the Labour Friends of Israel stall to discuss the two-state solution. Joan Ryan, MP for Enfield and Chair of LFI was on the stall. Ryan became very defensive and refused to answer the delegate’s questions. After the encounter Ryan met with her advisers and Robin and discussed how to turn inoffensive comments into an antisemitic and offensive tirade which could support an official complaint to the Party. Ryan invented words that the party member did not utter in order to create an illusion of ‘antisemitic tropes’ of Jewish control of finance and secret influence. Although the delegate was eventually cleared she suffered great distress and the Party has taken no action to hold Ryan account for her misuse of her authority and for her bullying of a person with none of her resources or influence. The JLM is now headed by Ella Rose who segued into her position as JLM Director straight from a post in the Israeli Embassy. Rose is shown threatening to use her Israeli military unarmed combat training to ‘take’ Jackie Walker after Walker, a Black Jewish party activist, had asked unwelcome questions at a JLM led Party training session at the conference. Rose could not ascribe any motive to anyone questioning the purge by the Party of critics of Israel to anything other being a “f—–g anti-Semite”. Masot is fearful that young people are increasingly hostile to Israel and offers to fund Robin to set up young LFI. Michael Rubin, a parliamentary officer of LFI is recorded saying, “The Israeli Embassy is able to get a bit of money…I don’t think money should be a problem really”. Masot is anxious to keep the link clandestine. “We do work really, really closely together. It’s just publicly we just keep the LFI as a separate identity to the Embassy”. It is not just the Labour Party that is of concern to the Embassy. They are greatly exercised by the small minority of the Parliamentary Conservative Party who are not members of Conservative Friends of Israel. An extract that has received wider publicity shows Masot meeting with a former aide to Robert Halfon, formerly Party Vice-Chair and Chair of CFI, plotting to “take down” Government Minister Alan Duncan. Since the programmes little has happened. Masot, his cover blown, has been recalled to Tel Aviv and sacked. Throughout the programmes Masot is shown in close contact with Ambassador Mark Regev and other senior Embassy officials. Despite that Foreign Secretary Boris Johnson has rushed to accept Regev’s assurances that Masot was a junior official flying solo. Even a cursory viewing of the footage shows that to be untrue and that there is a clear need for detailed investigation of this subversion and, in an old fashioned term, treason. Regev, himself, must be told to take the next plane back to Israel for abuse of his diplomat position. The reason for the reluctance to investigate, we can infer, is that it would reveal the most senior members of both main parties, with the exception of Corbyn and his close associates, and the Liberal Democrats, to be part of the network of Israeli influence. The House of Commons Home Affairs Select Committee’s report on Antisemitism that gave fuel to the witch hunt of alleged antisemites was chaired by LFI member Keith Vaz and included many members of the respective FOI groups; a number of whom had received all-expenses paid visits to those parts of Israel and the Occupied Territories it was convenient for them to be shown. The investigation allows us to understand better how Israelis influence works and frames political behaviour. Theresa May’s ill-judged endorsement of the fatally flawed ‘International’ definition of antisemitism which closely links antisemitism to criticism of Israel must be viewed through her membership of CFI. Her bizarre attack on John Kerry for his mild rebukes to Israel following the recent Security Council Resolution on the settlements might also be seen as reciprocity for previous career assistance from the Israelis. This article can only cover a tiny fraction of the disturbing content of the exposé and readers are urged to view the programmes for themselves. Only then can you fully appreciate the degree to which the policy of successive Governments may have been skewed to favour what is in Israel’s interests rather than that of their own people, let alone the Palestinians. Any human rights activists will recoil in horror at the way the Labour Party has become a pawn of Zionist organisations that place loyalty to Israel’s interests above advancing the Labour Party. Every Labour Party member must be demanding that each and every Party MP, Peer and Official who has betrayed the Party must be held to account. The evidence for every suspension for claimed antisemitic activity must be reviewed urgently and all those based upon confections of offence or statements lifted blatantly out of context revoked immediately.